Any time is the perfect time to clear your clutter! You can probably all agree that keeping your things up to date is important, but finding the time for a prolonged clearing session isn’t always easy. If your current clutter solutions aren’t working, just get a little support from Bright Delight and add a fresh perspective. 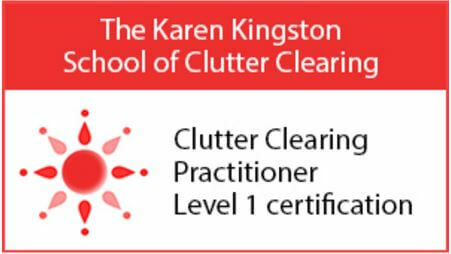 I trained with Karen Kingston, author of “Clear Your Clutter With Feng Shui”, and have been certified as a Clutter Clearing practitioner in December 2014. Karen’s international bestselling books have established her as the world’s leading authority on space clearing, and a leading expert on clutter clearing. She has over 35 years experience in these fields. Karen provides a very thorough and in-depth training, and I am listed on her Directory of Practitioners. It is my strength to create supportive spaces for my clients so that they feel empowered to step into new areas of their lives. With simple and practical tips, I can help you organizing your space to get yourself back in balance. If you’re looking for change, and you are ready to start de-cluttering but need some help, guidance and support, you’re in the right place. Bright Delight can help you declutter, sort, and organize your home where it is needed. I will work with you, showing you tried and tested techniques for effective clutter clearing that will make clutter clearing easier and the most effective for you. You’ll be able to continue using these techniques afterwards yourself. The training that I have done is different to other clutter clearing methods. This means that I do not just help you to declutter and organize your home; I also help you discover the deeper reasons why the clutter accumulated in the first place, to help prevent it building up again. Start today and organize your home to a place you love! A 3-hour session. This is the most usual option for people who need a good kick-start with their clutter clearing. A whole day clutter clearing session (6 hours with a one hour break for lunch). Choose this option if you have good stamina, a moderate amount of clutter, and would like to get instant results. A 3-hour clutter clearing session in your home every week for 4 weeks. Choose this option if you feel you need hands-on help to do any clutter clearing at all. You can switch to longer intervals as you gain confidence. A 6-hour clutter clearing session in your home every week for 3 weeks. Choose this break through option if you would like to move through bigger clutter projects. Establish new systems and learn how to live lightly for good. Yes, I want 'Clutter Clearing Option A'! Yes, I want 'Clutter Clearing Option B'! Yes, I want 'Clutter Clearing Option C'! Yes, I want 'Clutter Clearing Option D'!